An asthma attack is an episode of coughing, shortness of breath, or wheezing in people with asthma. During an asthma attack the airways in the lungs get smaller from swelling and inflammation. Asthma medicines help open the airways back up. Attacks can be caused by many things. These are called asthma triggers. Asthma attacks can be mild, moderate, or severe. Severe asthma attacks are medical emergencies. A person with asthma can use a peak flow meter to measure how bad an attack is. People should work with a doctor to find ways to control their asthma. Wheezing: wheezing is a high-pitched or whistling sound heard while breathing out. Many things can cause an asthma attack. These are called asthma triggers. A Quick-Relief Drug: this drug helps to stop an asthma attack that has already started. It can keep the attack from getting serious. It works fast to open the airways in the lungs during an asthma attack. These drugs should be taken at the first sign of an attack. A doctor may say to take it every day for 1-2 weeks after an attack. Quick-relief drugs are not meant to be used for weeks and weeks. Examples of these drugs are inhaled or nebulized beta-agonists (Proventil, Alupent, Albuterol, Ventolin). A Long-Term-Control Drug: this drug keeps asthma attacks from starting. It works slowly over many weeks to stop swelling in the airways. A person must take it every day even when they feel fine and can breathe well. Examples of these drugs are inhaled steroids (Aerobid, Azmacort, Beclovent, Flovent, Pulmicort, Vanceril) and cromolyn. Moderate: short of breath at rest or with walking. Prefers to sit and cannot lie down flat. Able to speak only part of a sentence with taking a breath. Wheezing can be heard. Yellow Zone: PEFR 50-80% of normal rate. Action: increase asthma drugs. Severe: very short of breath at rest. Speaks in single words. Struggling to breathe. Sitting hunched forward and cannot lie down flat. Wheezing may be loud. Red Zone: PEFR 0-50% of normal rate. Action: go to the emergency department right away. A peak flow meter measures how well a person can move air out of his or her lungs. It can measure how severe an asthma attack is. The normal Peak Expiratory Flow Rate (PEFR) for a healthy adult woman is 400-500. The normal PEFR for a healthy adult man is 500-650. During an asthma attack, a person's peak flow rate will go down. Every person with asthma should learn how to use a peak flow meter. Every person with asthma should also know their own normal peak flow rate. If a person's PEFR is less than 80% of his or her normal rate, then drugs should be increased. If a person's PEFR is less than 50% of his or her normal rate, he or she should go to the emergency department right away. Asthma attacks can be mild or serious. There are ways you can measure how bad an attack is. Serious asthma attacks are medical emergencies. There are ways to control and treat asthma attacks. You should work with your doctor to find ways to control your asthma. You can treat mild asthma attacks at home. Start your quick-relief medicine (albuterol or salbutamol) at the first sign of any coughing or shortness of breath. Do not wait for wheezing. You should use your inhaler (2 puffs each time) or nebulizer every 4 hours. Keep using the quick-relief medicine until you have not wheezed for 48 hours. The best way to stop a cough is by using your asthma medicine. Do not use cough suppressants from the drugstore. You can use cough drops for a tickly cough. During an asthma attack, you should keep taking your long-term medicine. Follow your doctor's instructions. Examples of these drugs are inhaled steroids and cromolyn. Drinking Liquids: Try to drink a normal amount of liquid. Being hydrated makes it easier to cough up the sticky mucus in your lungs. Humidifier: If the air is dry, use a cool mist humidifier to keep from drying out your airway. Hay Fever: If you have a runny or stuffy nose from hay fever, you can take antihistamines. These drugs will help your hay fever and will not make your asthma worse. Remove Allergens: Take a shower to remove allergens from your body and hair. These can include pollen, animal dander, and dust. Avoid Triggers: Avoid things you know can cause you to have an asthma attack. These may be things like tobacco smoke, cats and other pets, feather pillows, and exercise. Work With Your Doctor: There is no cure for asthma but you can learn to control it. Work with your doctor to find ways to do so. If you keep having asthma attacks, then your asthma is not under control. What to Expect: If you start treatment early, your asthma attack can be controlled. Your wheezing should be gone within 5 days. Step 1: Remove the cap and shake the inhaler. 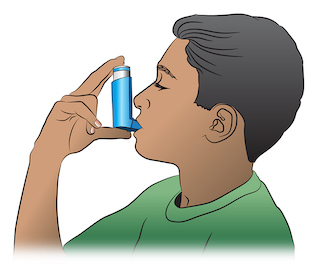 Step 2: Hold the inhaler about 1-2 inches (2-5 cm) in front of your mouth. Breathe out completely. Step 3: Press down on the inhaler to release the medicine as you start to breathe in slowly. Step 4: Breathe in slowly for 3-5 seconds. Step 5: Hold your breath for 10 seconds to allow the medicine to reach deeply into your lungs. If your doctor has prescribed two puffs, wait 1 minute and then repeat steps 2-5. Step 1: Shake the inhaler and then attach it to the spacer or holding chamber. Step 2: Breathe out completely. Step 3: Place the mouthpiece of the spacer in your mouth. Step 4: Press down on the inhaler. This will put one puff of the medicine in the holding chamber or spacer. Step 5: Breathe in slowly for 5 seconds. Step 6: Hold your breath for 10 seconds and then exhale. If your doctor has prescribed two or more puffs, wait 1 minute between each puff and then repeat steps 2-6. Step 1: Remove the cap and follow manufacturer's instructions to load a dose of medicine. Step 3: Put the mouthpiece of the inhaler in your mouth. Step 4: Breathe in quickly and deeply. If your doctor has prescribed two or more inhalations, wait 1 minute and then repeat steps 2-5. Your MDI could be empty without you knowing it. Using an empty MDI will not help your asthma attack. It will not give you any medicine. You cannot tell if it is empty just by shaking it and listening to fluid. There will still be leftover propellant in the MDI after the medicine is gone. A good way to tell if it is empty is to do the float test. Put the inhaler in a bowl of water. If it floats, it is most likely empty. A full inhaler will sink. The float test is not 100% accurate. 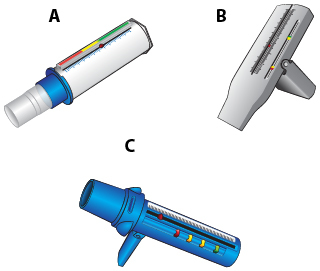 Every person with asthma should have a peak flow meter. This tool measures how well air moves out of your lungs. The number that is measured is called the peak expiratory flow rate (PEFR). You should measure your PEFR when you are feeling well. This will be your normal rate. During an asthma attack, measure your PEFR and compare it to your normal rate. This will tell you how severe an attack you are having. Step 1: Move the indicator to the bottom of the numbered scale. Stand up. Step 2: Take a deep breath. Fill your lungs completely. Step 3: Put the mouthpiece in your mouth and close your lips around it. Do not put your tongue inside the hole. Step 4: Blow out as hard and quick as you can. Step 5: Write down your score. Step 6: Repeat this 2 more times. The highest of the 3 numbers is your PEFR. Green Zone - Mild Attack: PEFR 80-100% of your normal rate. A peak flow rate in the green zone means that your asthma is under good control. Yellow Zone - Moderate Attack: PEFR 50-80% of your normal rate. This means that your airways are getting narrow. You need more asthma medications. Red Zone - Severe Attack: PEFR less than 50% of your normal rate. This is an emergency. Your airways are getting very narrow. You need to do something right away. Most often, you need to call your doctor or go to the hospital. Every adult with asthma should have a peak flow meter. A peak flow meter measures how well air moves out of your lungs. The number that is obtained is called the peak expiratory flow rate (PEFR). The "personal best" value is the highest PEFR number that a person obtains when they are feeling well. STEP 1 - Move the indicator to the bottom of the numbered scale. Stand up. STEP 2 - Take a deep breath, filling your lungs completely. 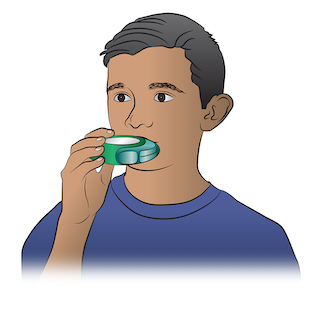 STEP 3 - Place the mouthpiece in your mouth and close your lips around it. Do not put your tongue inside the hole. STEP 4 - Blow out as hard and fast as you can. STEP 5 - Repeat the process two more times. STEP 6 - Write down the highest of the three numbers. STEP 1 - Remove the cap and shake the inhaler. STEP 2 - Hold the inhaler about 1-2 inches in front of the mouth. Breathe out - completely. 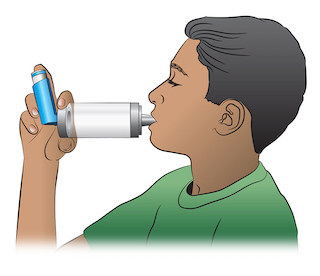 STEP 3 - Press down on the inhaler to release the medicine as you start to breathe in slowly. STEP 4 - Breathe in slowly for three to five seconds. STEP 5 - Hold your breath for ten seconds to allow the medicine to reach deeply into your lungs. A spacer (or holding chamber) can be useful for all people with asthma. A spacer makes it easier to correctly inhale the asthma medicine from the metered dose inhaler (MDI). A spacer is very useful in younger children and older adults. STEP 1 - Shake the inhaler and then attach it to the spacer (holding chamber). STEP 2 - Breathe out completely. STEP 3 - Place the mouthpiece of the spacer in your mouth. STEP 4 - Press down on the inhaler. This will put one puff of the medicine in the holding chamber or spacer. STEP 5 - Breathe in slowly for 5 seconds. STEP 6 - Hold your breath for 10 seconds and then exhale. If your doctor has prescribed two or more puffs, wait 1 minute between each puff and then repeat steps 1-6. STEP 1 - Remove the cap and follow package instructions to load a dose of medicine. STEP 3 - Put the mouthpiece of the inhaler in the mouth. STEP 4 - Breathe in quickly and deeply.